(2017). "Dermagran® Hydrophilic-B Wound Dressing". In (Eds.) , WoundReference. Available from: https://woundreference.com/app/topic?id=dermagran-hydrophilic-b-wound-dressing. Retrieved on 4/25/19. 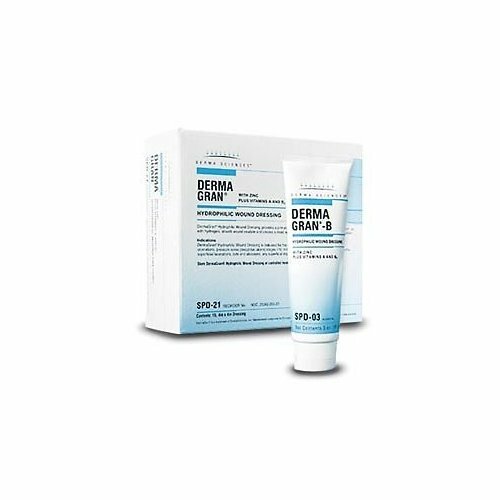 Dermagran-B Hydrophilic Wound Dressings provides a primary cover, filler or both for wound deficiencies, which absorbs wound exudate and creates a moist, mildly acidic environment to facilitate wound healing. Available as an impregnated gauze or tube, both contain Derma Sciences' zinc-nutrient dressing formulation and balanced pH technology. The dressing provides a moist, mildly acidic environment conducive to wound healing. In addition these products contain Vitamin A, Vitamin B6, Calcium and Magnesium. Indicated for use on skin ulcers (diabetic, venous stasis), stage I-IV pressure sores, surgical incisions and superficial injuries such as minor partial thickness thermal burns, superficial lacerations, cuts or abrasions. Does not contain natural rubber latex.